All parents want to raise happy, healthy children. This can become even more challenging when fostering a child. Many foster children come from abusive or neglectful environments. 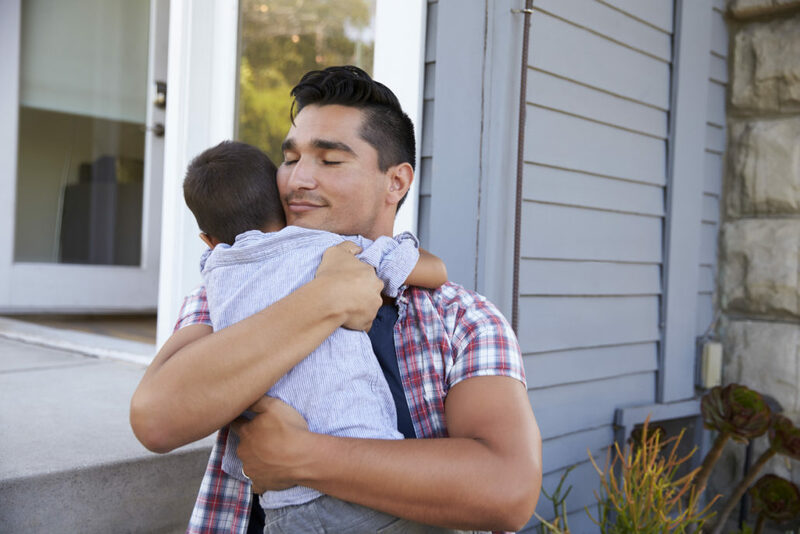 Foster parents strive to build confidence, self-esteem, and compassion in the children they care for so they can begin to heal and grow up to live productive, fulfilling lives. Of all these qualities, compassion seems to hold the key, contributing to the child’s overall well-being. The way a child treats others and themselves matters. Compassionate behavior leads to stronger relationship satisfaction, and feelings of happiness in life. Parental modeling, whether foster or otherwise, is the most powerful way to foster kindness in children. Situations happen on a daily basis that present golden opportunities to practice compassion. In doing so, you’re strengthening consistent, kind behavior in the child you care for. Below are five circumstances in which you can encourage kindness each day. Father hugging foster child on steps in front of home. It’s hard going through life without feeling sad or discouraged. When these emotions strike, it’s an excellent time to practice kindness. Let your child know it’s okay to feel the way they do. Give them plenty of support and affection. Encourage them to come up with ways to make it better. Do this for yourself, as well. Your child is likely observing you more than you realize. When your child can’t do a task and becomes frustrated, that’s the time to step in with a kind attitude. Let your child know that it happens to everyone. Ask them if they have any suggestions to help the situation. We all make mistakes. When they happen, you can model handling them with kindness. First of all, we learn from mistakes. Secondly, they happen because we’re trying. Angry, emotional meltdowns can sometimes create moments of chaos. This is especially true if you let your child’s strong feelings push your buttons. Every parent, to some degree, gets triggered by their child’s anger. Here is a moment to show kindness, although it can be difficult when you’re upset, too. Remind your child that feelings are part of being human. They don’t make them any less lovable or beautiful inside. Model acceptable ways to handle powerful emotions before they escalate into destructive behavior. When your child feels excited and happy, share in their joy. You’re showing kindness when you do. As parents and foster parents, we can get busy or preoccupied. We sometimes forget to show our happiness about their achievements. Let your child know how proud you are. Take the time to celebrate and appreciate how good they feel inside about themselves. Modeling kind behavior teaches your child compassion. They’ll begin to treat others and themselves with understanding, patience, and support. Through consistent compassion, you can change the life of a foster child and help them learn to trust and love. Indeed, they’ll begin to feel good about themselves and valued by you. You’ll see their kindness reflected back to you in the weeks ahead. Contact us for additional support. We’re here to help families succeed.